the famous streets in Gurugram – The Golf Course Road. Borrowing its name from Ernst & Young, it has become a perfect spot for all corporate employees. From ghar ka style aloo & keema parathas to Maggi and egg bhurji, this not so corporate eatery has become an icon for nearby employees working in MNCs that have now crowded the Golf Course stretch and especially the call centre employees who during late shifts survive on a cup of kadak chai and Maggi to along with it. 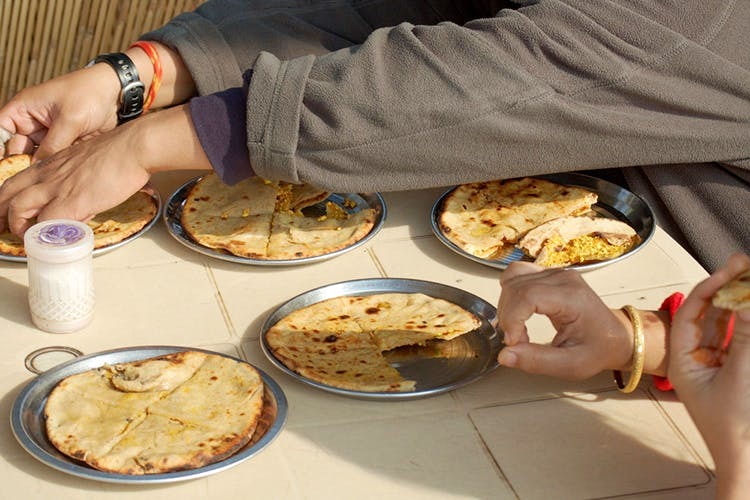 There’s a limited yet delectable spread available at this Dhaba. This place opens up at around 11 in the morning & is open till midnight. Light On Pocket, Heavy On Taste! With a variety good enough to satisfy the hunger pangs, this dhaba holds the exact roadside-feel that we all look out for during our highway trips. With bare minimum luxury, it is heavy on calories and taste, but quite light on the pocket. Parathas here start at just INR 60 and come a generous portion of butter! Their plastic-fied sitting arrangement is perfect for a quick munch and speedy office breaks. Whatever your reason is, an affordable meal or a late night food joint, E & Y Dhaba is a promising bet. For all those who work within close proximity, you now know where to head for a tasty meal while you still wait for the “Salary has been Credited” message.